An angry, wounded physician meets a wise Shaman in a moment of great crisis in her life. Her mind and her life are transformed by her relationship with the Shaman. She is awakened to live a life of compassion for herself and every living thing…to learn the nature of suffering, healing and the meaning of living this life in this moment. And the product is nothing short of a miracle…the quintessential wounded healer, who discovered that amid all the technology and pills at her disposal, the answer to her suffering was a choice…compassion. Purchase this book and learn about my work with Dr. Hewitt through her own words. Evolve by Dr. Mary Hewitt is an astonishing book in that the reader gets to experience Dr. Hewitt’s crisis and the healing that takes place once she reaches out to the Shaman, Roger LaBorde. If you’ve ever been curious about the world of a Shaman and how they interact to those who reach out for help, you will not be disappointed in this book. The wisdom and depth of knowledge of the spirit that Roger shares with Dr. Hewitt as he helps her through her crisis, will help the reader better understand their relationship with the Great Mystery, and thus themselves. I highly recommend this book to anyone who has an interest in the spiritual side of life. An angry, wounded physician meets a wise shaman in a moment of great crisis in her life. Her mind and her life are transformed by her relationship with him: She is awakened to live a life of compassion for herself and every living thing… to learn the nature of suffering, healing, and the meaning of living life in this very moment. And the product is nothing short of a miracle. Mary F. Hewitt, M.D., is the quintessential wounded healer, who has discovered that amid all the technology and pills at her disposal, the true answer to her suffering was a choice… compassion. Mary was taking a walk through her neighborhood in Texas one day. She stopped to gaze at the clouds of a gathering heat storm, and suddenly perceived herself to be inside the clouds. A few minutes later, it happened again. It wasn’t until later that night, when she woke up from sleeping feeling incredibly thirsty and hot, that she even could put words to her experience: She’d been hit by lightning, not once, but twice! A classic sign that one has been called by nature to be a shaman. Trying to make sense of what happened, and frankly to make sense of her life with its many discontentments, and pain held tight within her from traumas of years past, Mary reached out over to pipe carrier Roger LaBorde ([]) who was based in Colorado. He advised her to breathe while he made a decision whether or not he could be of service to her. Some come for healing… others for other reasons… and it is such a significant relationship that this is not a decision a shaman would take lightly. In Texas, Mary began to breathe through her every moment of anxiety and impatience. As she did, her perceptions began to shift. She discovered more compassion for herself… and the roots of her habitual defenses becoem startlingly clear. An intense correspondance by email began, which led to deep conversations about the role of healers in our culture. Mary learned a new way of interacting with her patients and the doctors in her hospital–and her family relationships also gradually shifted to a more authentic and intimate dynamic. At essence, compassion was emerging… compassion for self, compassion for others. Thus, the world was made better, as the ripples of Mary’s transformation spread. There is an energy in this book that helps us look more closely at where we are being hard on ourselves, and where we are perhaps aiming to control that which is not ours to command. Our medical systems are in dire need of being humanized, and few from among those who manage such systems are capable or willing of looking at the system in the way Mary Hewitt does here. She is courageous and she is an authentic voice worth listening to, as she opens us to look at places in her life that most others would hide. In doign so, she has offered us a profound gift. This book is a treasure. It’s the story of one M.D.’s healing journey back after being struck by lightning. 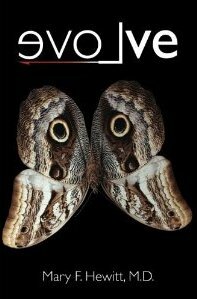 Evolve is a personal and candid account of Mary Hewitt’s spiritual awakening. In some ways it compliments Jill Bolte Taylor’s left to right brain shift after suffering a stroke (Taylor: My Stroke of Insight). Unlike Jill’s forced choice, Mary willingly accepted and surrendered to her path, a journey into uncharted territory. One major difference in Mary’s experience is that she had a guide, Roger LaBorde. Roger is a westerner trained in the traditions of Native American shamanism. He was “adopted” by Gerald Red Elk and trained by Gerald and others. Roger’s gifts, including communicating with people in a coma and ability to bring them back to consciousness, have been well documented by physicians as well as appearances on several television documentaries and magazine stories. In Mary’s case, Roger assisted her in uncovering and breaking beliefs and unconscious assumptions about people and the world, one by one, breath by breath, present moment by present moment. The benefit and gift for us is that Mary meticulously recorded her analytical meditation process. Her writing is clean and easy to understand and follow. More importantly, it provides us with her moment to moment processing, serving as a clear example of engaging in this work for our own growth and illumination. I highly recommend this book to anyone wanting to evoLve, for anyone wanting to become fully awake. « What Is a Shaman?